OKLAHOMA CITY – Webster Middle School Athletic Director Katrinka Greear could have retired several years ago. She’s spent more than 30 years coaching softball. After the nonprofit organization Fields and Futures renovated her softball field, she didn’t want to leave. Her field has hosted the all-city softball tournament for three years. Other community teams use the field as well. “It’s been a game changer,” she said. Oklahoma City Public Schools Director of Athletics Keith Sinor said Greear isn’t the only one who has stuck around when she could have retired. He said he’s had several coaches stay in the district because they want to work on their new fields. Since Fields and Futures started working in the district, the attrition rate has dropped almost 50 percent. He said for several years, the attrition rate was about 35 percent. In 2015, it was 19 percent. He equated the change to being an owner versus renting. In the past, the coaches were looking for the next job. Now, they’re being more invested. Greear’s field had a rusty fence with holes in the outfield. She said she had her girls put their ball bags around the fence so the balls wouldn’t roll out. For games, the team would have to go to a park near downtown, and the surrounding neighborhood never followed them to the games. Now, a snow cone truck visits the games and neighbors come watch. “It’s brought the community together,” she said. 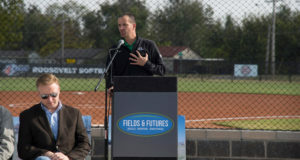 Fields and Futures co-founder Tim McLaughlin said the organization is almost at its halfway point with the Oklahoma City schools’ fields. There are 24 more fields to redo or build, with 20 already completed. The next project is an $800,000 complex at Southeast High School, where Fields and Futures will build softball, baseball, football, and soccer fields. The organization is still raising money for that project. The attrition rate change is astonishing to McLaughlin. McLaughlin said every completed complex gives him energy to do more, but the organization can work only as the money is available. Grant money helps fund some projects as well. And Sinor wants that work to continue quickly as well, because when his coaches stick around, the community is improved.